The Donegal manager says he takes great satisfaction from witnessing the likes of Michael Murphy and Colm McFadden achieve All-Ireland success. 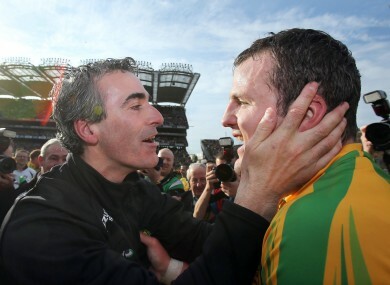 Jim McGuinness and Michael Murphy. JIM MCGUINNESS MAY be the man whose name was being sung around the hills of Donegal late last night and into the early hours of this morning, but the All-Ireland-winning manager was quick to turn the focus away from himself and onto his players. The Ulster champions, who were favourites going into yesterday’s final, delivered on the day with a four-point victory over Mayo thanks to two early goals from Michael Murphy and Colm McFadden. Since taking charge in 2010, McGuinness has masterminded the capture of two provincial titles and now brings Sam Maguire back to Donegal for the first time in two decades. However, the 39-year-old revealed that his personal satisfaction comes from seeing his young panel fulfil their potential. “It’s not about me, it is about this group of players trying to get the most out of their careers and as we sit here today they have to ulster championships and an All-Ireland,” McGuinness said. “As a player and as a manager I just want them to get the most our of their careers as possible. I think that is what every manager should set out to deliver. We got a bit of stick last year for the way we played but we did get an Ulster championship in the bag, and now they have two and they have an all ireland. All you want to do is fulfil your players’ dreams and try and leve them when they’re retiring that there were ups, there were downs, there was a lot of effort put in, a lot of sacrifices but there are a lot of memories. “It feels absolutely unbelieveable and I am so proud of all those players, they have been on a hard road. When you take over as a manager, the one thing that you want and you hope for is that the commitment and the hunger to try and achieve will be within the camp. From the very first day we got our hands on them they had that and they worked very, very hard. “They’ve knuckled down. I work off four words – commit, focus, believe, achieve. The hardest thing is the commitment, you must make the commitment,” he added. “These boys have made a commitment to their county, they have focussed on that commitment, they have believed even through thick and thin that we could get here and we’ve got here now. Email “'You just want to see the players fulfil their dreams' - McGuinness ”. Feedback on “'You just want to see the players fulfil their dreams' - McGuinness ”.